I mean, don't get me wrong, for better or worse Act 15 is still Sailor Moon Crystal - it has dodgy animation issues (although not as many as there have been), some issues of pacing (although once again, not nearly as much), the things that have dogged the series from the very beginning - but goddammit, it felt like the show was actually trying with its new source material, and I couldn't help myself from appreciating that, and enjoying it. Instead of my usual recap, I thought I'd go through a few things from the episode that actually could end up bringing about a positive change for the show. Sure, it's nowhere near the levels of comedy that either the original anime or even the manga, but after what felt like eons of melodrama, it was nice to just see a bit of goofballery and fun in this episode. Usagi's over the top reactions with Chibi-Usa, the slapstick of the scene where Usa brainwashes Usagi's family into accepting her as one of there own, even just the Senshi getting some downtime where they can have a laugh and a joke with each other as actual friends - it got serious when it needed to, but it was nice just to see some lighter scenes in the series again. It helps the characters feel like actual characters instead of vehicles for melodrama. Speaking of which, it was equally refreshing to spend some time with the characters outside of the Usagi-Mamoru love-in. One of my biggest criticisms of the show so far has been its complete willingness to sacrifice any and all characterisation for the other Senshi in order to beef up the focus on Usagi and Mamoru - but in this episode at least, they don't feel like the focus. When the girls hang out at the cafe in the scene above, you actually get the sense of them having lives and relationships with each other outside of just being the Senshi. Makoto has the hots for her new friend, Mamoru's Kohai, Ami and Rei playfully launch jibes at Usagi about Chibi-Usa, they talk about school and stuff. Rei gets the focus in this episode, and it's nice to see her taking on some initiative as she investigates her visions, and it was equally appreciated to see her have some personality as she does so (her in-camera snark about UFO sightings was pretty great). It doesn't feel quite earned as they're barely characters (and in a cheap way, it almost relies on your familiarity with the source material to make them feel like characters, instead of, you know, actual characterisations) thanks to the lack of character building in earlier episodes, but the other Senshi are starting to feel like characters instead of cardboard cutouts that exist to prop up Usagi. It's baby steps, but even those are a good thing in Sailor Moon Crystal. After the awful treatment of Beryl, Metalia and the Shittenou, I didn't have much hope for the way SMC would handle the Black Moon clan, but at least so far it we actually got to see them being Villains instead of standing around going 'omg Legendary Silver Crystal!'. Okay, they do that too - and they share the Dark Kingdom's penchant for using their not-at-all-secret villain team name in all of their supposedly undercover plans - but there was at least some active engagement in villainy this week. I mean, they straight up murder two people - I'm pretty sure that's the first time we've scene civilian casualties in the show, instead of everything being fine after a quick Moon Healing Escalation! They have a plan that actually works (it's sort of brushed under the rug, but the intent was to draw out Sailor Mars and capture her, not just 'Get the Legendary Silver Crystal)! And it was equally refreshing to see the Senshi actually kill a villain, offing Koan for good instead of having her conveniently teleport out of the way of the attack for no real reason other than to be unceremoniously bumped off some time later (LOOKIN' AT YOU, SHITTENOU). Many fans consider Demande and his cronies to be superior villains to Beryl and Metalia anyway, and although the bar was already set excruciatingly low, they still rose above it. In my last recap, I mentioned that Sailor Moon Crystal seems to spend an awful lot of its action getting the heroes incapacitated - not particularly great fun when it comes to fight scenes, especially for a show that ostensibly builds itself around the empowerment of its female characters. However, act 15's battle with Koan at the episode's climax, but sweet - and it's not only enjoyable to watch, but it also allows itself to establish our heroes as a more confident, competent fighting force. The addition to the manga scene of having Ami and Makoto chime in with attacks - Ami actually getting an offensive and support ability on top of her 'hey guys, look, it's foggy!' power - was a welcome change, but you also get the moment of realisation that the Senshi are more powerful than they were before. Not just thanks to their new transformation wands, but through an imbued sense of confidence. They know what they're doing now, they work as a team, and that translates into a way better fight scene. 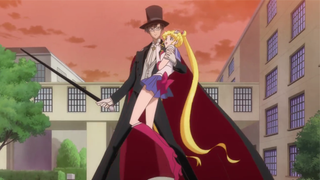 Okay so Rei does get incapacitated and capture, and Mamoru goes classic-tuxedo-mask by only showing up at the most absolutely necessary moment and doing bugger all to help (although thankfully he doesn't get a 'Sailor Moon do the thing!' this time) but still. Baby steps. So it's so far, so good for SMC's second arc, and I'm glad the show managed to right itself, even momentarily, after such a bad run of episodes lately. Time will tell if it can keep it up - after all, the series itself got off to a decent start before slowly being overwhelmed by its problems - but for now, we got a pretty good episode of Sailor Moon, and I'll take that whenever I can get it.